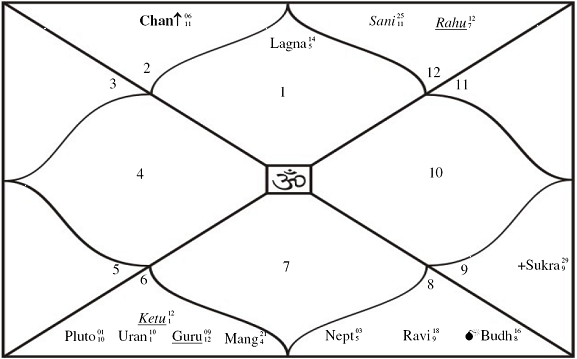 Notice that Rahu and Guru will pass through his tenth house of career aspecting his second house of wealth, sixth house of diseases and enemies, aspecting natal Chandra the lord of the fourth house, aspecting natal Mangal the lord of the ascendant, natal Guru the lord of the ninth house of bhagya and luck, aspecting natal Ketu, Uranus and Pluto. Transiting Ketu will aspect natal Budha the lord of the third house of efforts and associations as well as lord of the sixth house, aspecting natal Surya the lord of the fifth house of love, kids and creativity. Transiting Shani will be in the fifth house aspecting the second house and Chandra. During this period he will be ambitious for professional success. People in authority or power will possibly be very helpful to him now. His attention will be on your work and health. Regarding work, he can expect increased responsibility, or possibly difficulties. In certain circumstances, there can be exposure to disagreeable experiences at work. With respect to his health, he may make every effort to look after his body properly, because there is the potential to become tired and run down. During this phase his attention will be focused on his career and public reputation. This can be a period of great success in the aforementioned areas, but it will equate to the amount of energy he has put into them. He can expect to advance in life now and to receive acknowledgement and recognition for his efforts. His work may become more international in some way at this time. During this period his concentration will be on matters of the heart and possibly children. This can be a period in which he will seek to firm up or formalise love relationships. He may enter into love unions at this time with someone who is older. Here he may seriously consider becoming a parent. In this period he may take avid interest in learning new arts and sport. Here he will be again facing another turning point in his life with regard to his personal development and future direction. He may determine his priorities and face certain realities. He may take some decisions about, separations which are necessary in order to move forward. Difficulties will no doubt be apparent now, but if confronted and dealt with, the long-term gains outweigh the short-term pains. There is a lot he can achieve for himself and others now. At this time, important and significant people could come into his life. Females, in particular, can be influential during this period. His attention will be on his work and health. Regarding work, he can expect increased responsibility, or possibly difficulties. In certain circumstances, there can be exposure to disagreeable experiences at work. With respect to his health, he make every effort to look after his body properly, because there is the potential to become tired and run down. This period brings the rewards of hard work commensurate to the amount of energy he had put in. While this can be a financially prosperous time. At this time, important and significant people could enter or exit his life. Males, in particular, can be influential during this period. Contact with the public through the media is also possible here. Alternatively, there can be strains in his relationships caused by ego conflicts and displays of arrogance leading to possible estrangement or separation. This can be a good time for making business contacts and for negotiating and exchanging ideas with others. Alternatively, there could be the inclination to break-off communication with another or others. Steady as she goes is the essence of this period, in respect to his emotional life and home life. He may desire security, constancy and stability in home and family during this period. This configuration can bring pleasing or affectionate contacts into his life now. Associations with artists, creative and refined persons or those active in the arts and entertainment sectors are possible. Love affairs are also possible. He will want to expand and grow at this time. He will have good self-discipline and common sense now, coupled with strong powers of perseverance. Whatever he applies himself to now – be it your work, buying and selling, or business activity – he will demonstrate sound judgement and a responsible and practical attitude. He may buy some piece of real estate now. During this period there is a possibility to form contacts with others who share similar outlooks and beliefs. There may be the opportunity to make an inner connection with another. He will have to work harder for success now. This is a time for taking stock of things and cutting back. Money will be tighter. Nothing seems to happen quickly enough. However, successes are possible now through hard work and self-discipline. Ganesha finally and summarily feels that the year will be important for his career and health. Wishing him many happy returns of the day.